We’ve designed a Coin Pouch that works, feels, and looks like Magic. It's an innovation on the oldest accessory and makes handling coins easy, comfortable, and fun! No zippers, buttons, or snaps that add unnecessary bulk to the coin pouch, yet the coins are locked in thanks to the ingenious & simple product design. Coins automatically stack within the pouch to take up minimal space. We’ve designed a Coin Pouch that works, feels, and looks like Magic. It's an innovation on the oldest accessory and makes handling coins easy, comfortable, and fun! You will love it! No zippers, buttons, or snaps that add unnecessary bulk to the coin pouch, yet the coins are locked in thanks to the ingenious & simple product design. Coins automatically stack within the pouch to take up minimal space. 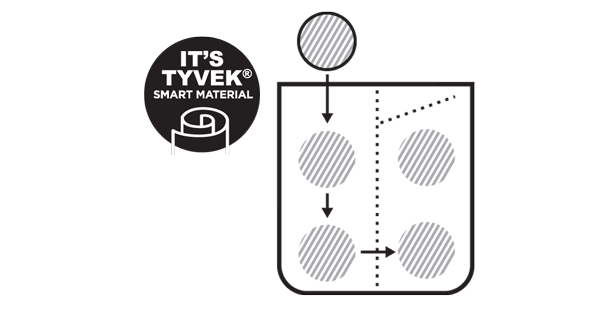 Travel anywhere and never mind the elements, Tyvek can handle almost anything that's thrown at it. Carry your daily essentials with your type of style.